Summer has always been a time marked by outdoor activities, including fairs. Americans have enjoyed state fairs since the mid 1800’s. One of the first state fairs was in Syracuse New York where this year, annual festivities have made headlines for environmental reasons. 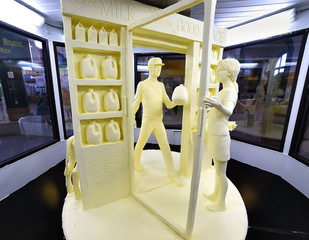 Butter sculptures at the New York fair have garnered a lot of attention over the years. This summer (2018) was no exception but the legend of this year’s piece of art lingers on even now that the fair is over. The sculpture, called “Your Milk Comes From a Good Place” shows a farmer delivering milk from his farm to a customer in a store. It was on display up until the fair came to a close September 3rd but has now been taken apart and will be recycled into renewable energy. While we can’t say for sure how Noblehurst Farms will be processing the butter and turning it into renewable energy, we do know that others have tried using butter as a source of power by mixing it with manure. Microorganisms in the butter-manure mixture, warmed up by a heated methane digester do most of the work as they feast on the fatty concoction. The microorganisms break down fat molecules into less complex molecules then methane is produced. Methane can burn in an engine and be converted into electricity. Once the mass is broken down into methane, all that is required is a hook up to a generator. In previous blogs we have mentioned the use of ham fat to make renewable diesel fuel and olive tree waste to generate energy. The point is that more people are opening their minds to the possibilities of turning what was once considered waste into something of value.